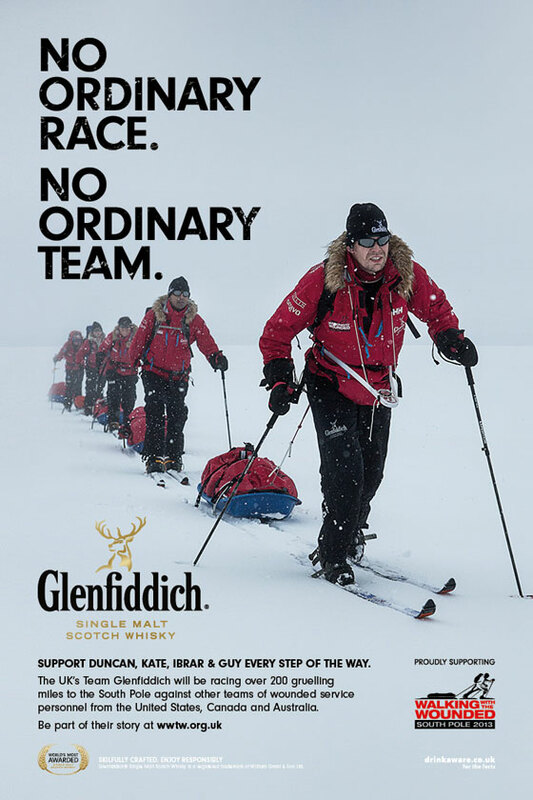 Glenfiddich single malt whisky is supporting the Walking With The Wounded (WWTW) fundraising expedition to the South Pole with a national advertising campaign by Captive Minds, across outdoor, press and radio. The South Pole Allied Challenge campaign breaks on Monday 4 November, with an ad budget of £600,000. The advertising directs people to the Walking With The Wounded website where they can donate to the charity and create their own sponsored challenges. The whisky brand is sponsoring Team Glenfiddich, the UK team, which will compete against other, teams of ex-soldiers from the US and the Commonwealth, in a race to the South Pole. Captive Minds is running the expedition on behalf of WWTW, the UK based charity that funds the re-training and re-education of wounded servicemen and women. This is the second time Glenfiddich has sponsored the charity – last year it backed an expedition to Everest. The 2012 event's advertising featured the line, "No Ordinary Mountain, No Ordinary Men". This year, the creative uses the headline, "No Ordinary Race, No Ordinary Team". 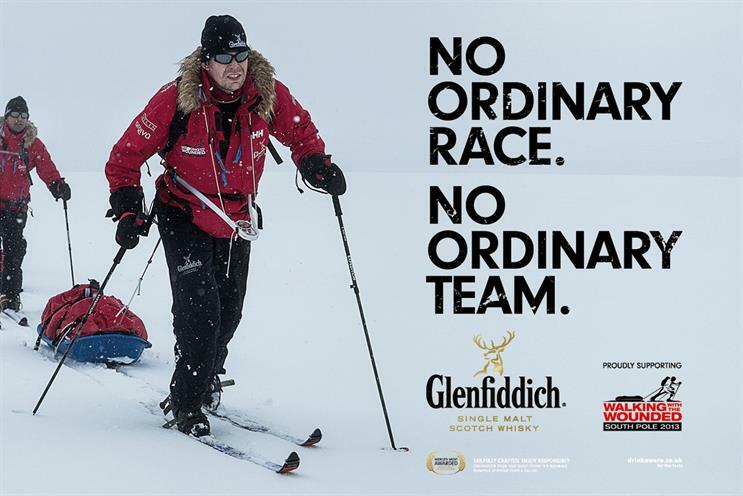 Team Glenfiddich comprises right-leg amputee Guy Disney – taking on a second Pole after joining WWTW in the Arctic in 2011 – and left-leg amputee Kate Philp – the first British woman to lose a limb on the frontline. Other team members include double-leg amputee Duncan Slater, and arm-amputee Ibrar Ali, MC, a member of the Yorkshire Regiment. They will be travelling 335 kilometres across the Antarctic. The campaign’s core image shows the kind of atrocious conditions expected in the South Pole and was shot by adventure photographer Petter Nyqvist during a genuine training expedition on an Icelandic glacier. Creative director at Captive Minds was Simon Baird. The campaign will appear on six- and 12-sheet posters, London Underground 96 sheets, high-profile digital sites in UK cities including London. There will also be press ads in national broadsheets and the London Evening Standard, as well as a 30-second radio campaign on Absolute Radio. On 17 November, the day Team Glenfiddich flies out from Heathrow, digital sites along the departure route and at Terminal 3 will display "Good Luck" messages. The media package, which was bought by The Village, also includes a partnership with the Telegraph Group, featuring a series of exclusive human interest advertorials in The Sunday Telegraph and live news updates. Sarah Harding, senior brand manager of Glenfiddich, said: "The Everest expedition was a fantastic partnership for Glenfiddich and we are excited about continuing this relationship for the South Pole Allied Challenge in 2013. "The 'can do' attitude of the wounded service personnel echoes the Glenfiddich pioneering spirit of which we are so proud." Marcus Chidgey, managing director at Captive Minds, said: "In just three years, Walking With The Wounded has grown to become one of the most attractive charity platforms in the UK for brand partnerships. "Captive Minds has worked hand-in-glove with the charity and its sponsors to tell inspirational stories, generate global reach and deliver dedicated activation. "This is the first in a host of innovative marketing ideas that we are proud to be executing for Glenfiddich."